"Tonight's story, I confess, intrigues me; it is another instance from my notebook of the miracles which turn out to be no miracle. You are warned, good friends, that I shall try to deceive you until the end." 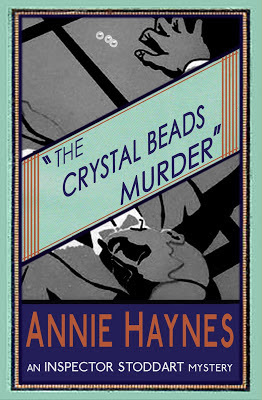 A week ago, I posted a review of an obscure, Golden Age mystery novel, namely The Crystal Beads Murder (1930) by Annie Haynes, which is a blog-post I titled for equally obscure reasons "The Devil in the Summer-House" – that also happened to be the title of a radio-play by everyone's favorite composer of seemingly impossible problems. This prompted a comment from Sergio, who thought it cheeky to caption the post in such a Carrian fashion and how it gave him expectations for "a classic radio review." I hadn't planned on doing such a review, but I need very, very little encouragement where John Dickson Carr's work is concerned. So why not, I thought, why not listen back to a small selection of Carr's radio-plays and ramble about this often neglected part of his writing career – which tends to be even more overlooked than his contributions as a writer of historical mysteries. 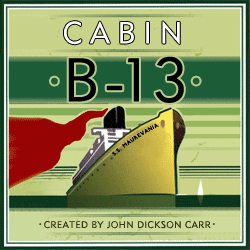 "Cabin B-13" is arguably Carr's most accomplished piece to hit the airwaves and a classic example of the old-time radio shows, which was performed twice on Suspense in 1943. What's not as widely known is that the episode became the premise for an eponymous titled spin-off series on CBS. Cabin B-13 starred Arnold Moss as Dr. Fabian, an all-but-forgotten series character from Carr's body of work, who's a ship surgeon aboard the luxurious S.S. Maurevania and invited to listeners to come to his cabin to share some horrifying tales of "the strange and the sinister." There are only a few episodes that survived the passage of time, but the ones that did are distinctively Carrian in nature. "The Bride Vanishes" is one of the shipwrecked survivors of this show and the nature of the problem is one of those pesky, apparently impossible problems – a "miracle" if you will. A newlywed couple, Tom and Lucy Courtney, found an inexpensive, but lavishly furnished, abode on the sun-soaked island of Capri, Italy, which comes to no surprise when they learn about the haunted "balcony of death" attached to the villa. A girl by the name of Josephine Adams "disappeared like soapbubbles" from that balcony in what appeared to be "a first grade miracle." She was "all alone" on that "balcony forty feet up a cliff," which was as "smooth as glass," but she couldn't have fallen or thrown off because "there was no sound of a splash" – and she couldn't have come back because "her mother and sisters were in front of the only door." This vanishing-act happened in less than 15-seconds. It's remarked upon that Lucy is a spitting image of Josephine and people from the local, English-speaking colony are warning them to stay clear of the balcony or even return to Naples, but that would've made for a very dull story – wouldn't it? Well, Lucy vanishes under similar, unexplainable circumstances as Josephine and the story begins to uncoil itself during the subsequent search, but even in a suspense story Carr managed to chuck in a few clues to help you piece together the method – which reminded me of a Baynard Kendrick novel and that helped me figuring out the method. All in all, a good, nice and a well put together story that was nicely brought to life by the performance of the cast. So, yes, I enjoyed this particular play. 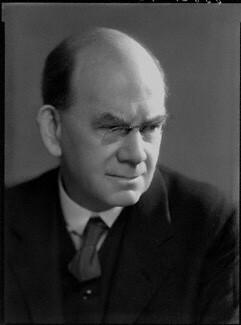 The Great John Dickson Carr! "The Sleep of Death" is another shipwrecked survivor from this series and tells a story of Ned Whitehead, a young American, who has bright, diplomatic career ahead of him and recently has fallen in love with a girl from an old French-Hungarian family – only her stern "dragon uncle," a Hungarian count, "who looks as black as a thundercloud" stands in the way of their marriage. To proof himself to his future in-laws, Ned proposes to spend a night in "the circular bedroom," better known as the Tapestry Room, which is situated "high in the castle tower" of the family's French chateau. The walls are " hung with rare tapestries" and permeates with "a haunting atmosphere of witchcraft and death." For two hundred years, everyone who slept in that room died without a mark to be found on their body! If the premise sounds familiar, you would be correct, because it's a slightly altered version of "The Devil’s Saint," originally written for Suspense, which cast Peter Lorre perfectly as the caliginous count. That's really all that can be said in disfavor of this episode: 1) it's a rewrite 2) it lacked Lorre. Otherwise, it's as excellent a suspense story as the original with a nifty twist ending and a logical, fairly clued explanation as to how the previous occupants of the Tapestry Room died – which made the original version a classic episode of that show. Finally, "London Adventure," also known under the titles "Bill and Brenda Leslie" and "A Razor in Fleet Street," which is one of Carr's Baghdad-on-the-Thames stories and has Bill remarking in the opening scenes of the episode: "It [London] has put a spell on my imagination ever since I was a boy so-high," followed by "Sherlock Holmes, Dr. Fu-Manchu" and "hansom cabs rattling down the fog." Yes, the smell of adventure is in the air! And, as if on cue, a police-official from Scotland Yard swings by and has brought some bad news for the newly arrived couple. It appears that Bill Leslie, an American diplomat, is a dead ringer for "Flash Morgan," a man wanted for several ripper-style murders, and he might be interested in stealing Leslie's identity – because slipping out of the country is a lot easier when you have the perks that comes with diplomatic immunity. The inspector urges them to stay in the hotel, but Bill smells adventure and soon finds himself in tight, tension-filled spot when he flees inside a barbershop in Fleet Street. There's an apparently impossible throat-slashing inside the locked barbershop, while Bill and the barber swear they never left each other out of sight, but the locked room is merely the topping on a great (if short) adventure story that Carr's characters always seem to yearn for. It's another episode I would definitely recommend, especially if your taste or somewhat similar to mine, Bill Leslie and Carr. It's that kind of story. I hope this classic radio review has earned a few tips from Sergio's fedora and let me end by pointing out the review I posted yesterday of Robert van Gulik's The Chinese Maze Murders (1956), which also contains a locked room mystery. Because you can never have enough of those. Never! "Four things belong to a judge: to hear courteously, to answer wisely, to consider soberly and to decide impartially." Late last month, I posted a review of Judge Dee at Work (1967), a collection of eight, historical detective stories situated in Imperial China of the 7th century, which were penned by the late Robert H. van Gulik – a Dutch diplomat and fervent sinologist. I had read the stories from that volume before, but they reminded me there were a few novels from the series I had yet to read. So I elevated one of them to the top of my to-be-read pile and the only surprising part about picking this particular title is why I hadn't read it before. 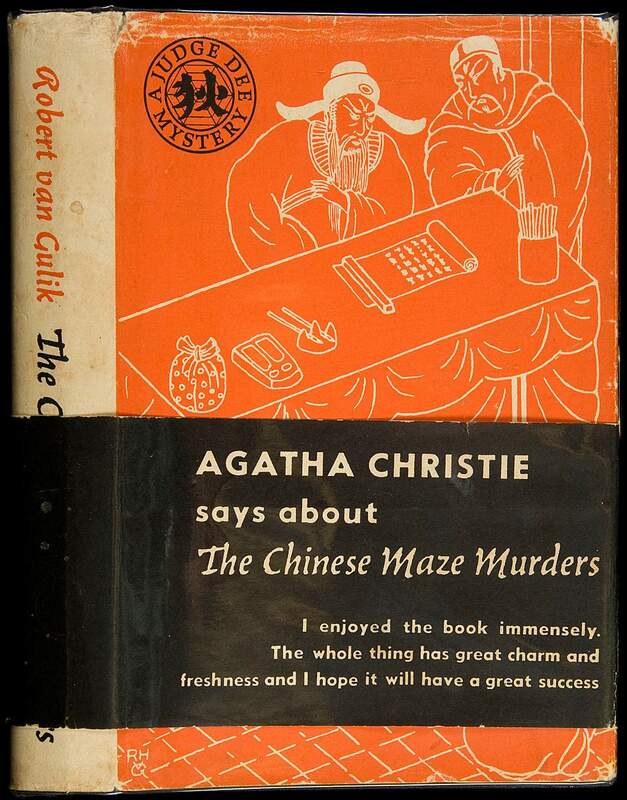 The Dutch and English-language editions of The Chinese Maze Murders (1956) were preceded by publications in Chinese and Japanese, which were released in 1951 and 1953. 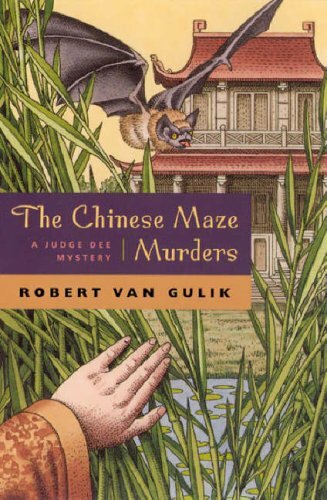 Needless to say, the chronology of when and where the Judge Dee novels were written/published can be Confucius confusing, but The Chinese Maze Murders is one of the earlier novels – which did its part in establishing the series and helped popularizing historical mysteries in the process. The Chinese Maze Murders has Judge Dee arriving in Lan-fang, "a far-away district on the Northwestern border," and, as "a border town," had "to reckon with sudden attacks from the barbarian hordes of the western plains." However, the less than heartwarming and disrespectful reception the new magistrate and his entourage receive proved that the town had already fallen from within. Lan-fang is under the thumb of a self-styled tyrant, named Chien Mow, who usurped power in the district a decade ago and the only magistrate who dared to go up against him ended up on the riverbank – "his throat cut from ear to ear." As a consequence, the court is in abeyance. So the first course of action for the new magistrate is disposing of "this miserable local tyrant" and reestablish a rule of law, which occupies a large swath of the first half of the story, but it's fun to read how a small, outnumbered group of people outsmarted a small-time despot. It's not entirely comparable to the scheme Nero Wolfe hatched in Rex Stout's The Doorbell Rang (1965), in order to outwit a corrupt FBI, but the comparison suggested itself to me when reading it. There are, however, other matters that Judge Dee finds of "absorbing interest" and prefers to concentrate on "two most interesting problems," which are "the ambiguous last will of old Governor Yoo" and the "murder of General Ding that is announced in advanced" – who holed himself up in his hermitically sealed library in his well protected, barricaded home. Hey, I told you it was kind of weird that I hadn't read this one before! Well, the governor's last will is drawn up in a painting depicting a fantasy landscape and it's included among Van Gulik's illustrations. However, this plot-thread is thin, but dyed scarlet red and run through practically all of the other cases – which makes it difficult to comment upon without giving away too much. Luckily, there's also a murder in a locked room. General Ding had "fought a victorious battle against barbarians across the northern border," but felt "unexpectedly compelled to resign" after returning to the capital and retired to Lan-fang. A month before Judge Dee arrivals he began "to notice that suspicious looking men" loitering in the neighborhood and began to wall himself up in his home. You have to take that last part somewhat literally. The gates of the general's mansion are "locked and barred day and night" and "walled up all doors and windows of his library save one." The one remaining door "has only one key," which the general always kept with him. All of these safety measures proved insufficient in keeping an assassin from entering the sealed library and jab a small, peculiar looking dagger with a poison-daubed blade in the general’s throat. Van Gulik noted in his postscript that The Case of the Sealed Room "was suggested by an anecdote concerning Yen Shih-fan," who was "a notoriously wicked statesman of the Ming period who died in 1565 AD," which gives some historical credence to a type of locked room-method that's always difficult to pull off without leaving the reader disappointed – especially the spoiled ones such as yours truly. I mention this here not because I was disappointed about the method, but it felt terribly out-of-place in 7th century China. But, hey, who am I to argue with Van Gulik? He was the expert. The only problem I had, plot-wise, was that's next to impossible to deduce or even guess how it was done and the murderer was better hidden than you'd expect. I figured the murderer had left poison in the room, before the general locked himself in, and the small, poisonous blade was stuck in him after the door was broken down as a red herring that was to draw attention away from the actual poisoning-method. Well, I was wrong. Anyhow, I think Paul Doherty would nod approvingly at the murderer's motive and army background of the killing, which are plot-elements that regularly turn up in his work. These are just a handful of the problems thrown in Judge Dee's face upon his arrival in Lan-fang, which also involve a missing girl, barbarians and high treason. Most of these problems seem to eventually lead to an overgrown "country estate at the foot of a mountain" with "an old, dark house surrounded by a dense forrest" and has the titular maze – which is "bordered by thick undergrowth and large boulders" that "form an impenetrable wall." As I said at the beginning of this post, The Chinese Maze Murders packs a lot of plot and storylines in this single, novel-length story, which is both a strength and a weakness. You're unlikely to get bored with this book, because there's always something happening or turning up – right up to the end when some of the culprits find themselves on the execution grounds about to pay for their crimes. On the other hand, there's so much happening that, plot-wise, the book misses the finesse and grace of some the later, tighter plotted-and written novels – such as The Chinese Gold Murders (1959) and Necklace and Calabash (1967). Either way, fans of the Judge Dee series and historical fiction won't be disappointed by this entry in the series. On final, semi-related note: I have tagged nearly 200 blog-posts as a locked room mystery. I see a commemorative filler-post in the not so distant future about this two-hundredth locked room post! "Oh dear, I never realized what a terrible lot of explaining one has to do in a murder." 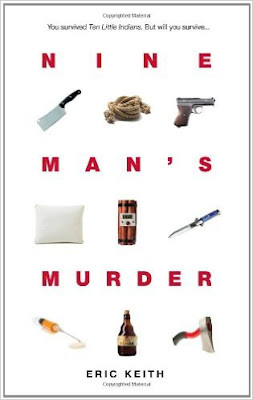 The collaboration between Dean Street Press, an independent publisher "devoted to revitalizing good books," and Curt Evans, genre historian and author of Masters of the "Hundrum" Mystery (2012), is arguably the best thing that happened to the forgotten detective story since the Rue Morgue Press and Crippen & Landru opened for business. It's a collaborative effort that's slowly bringing E.R. Punshon's work back into circulation and republished, after close to a century of neglect, two mystery novels by Ianthe Jerrold – of which one, Dead Man's Quarry (1930), is a textbook example of a forgotten classic. And that's not just me saying that. Annie Haynes is a mystery writer Evans first wrote about in 2013 and at the time he "knew of only two living persons," besides himself, "who had read any of her books." Thankfully, Dean Street Press will be adding her work to their expanding catalogue and Rupert Heath was kind enough to supply me with a review copy of The Crystal Beads Murder (1930), which was probably completed by "Anthony Gilbert" after Haynes untimely passing. 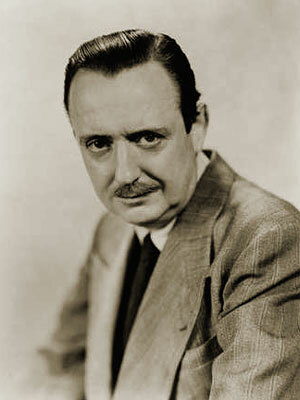 There are other persons of interest who could've completed the manuscript, but Evans made a compelling case as to why it might have been Gilbert. I'll refrain from retracing parts of the introduction Evans wrote, but, if you want an idea of what kind of person Haynes was, there's a short, interesting foreword by one of her close friends, Ada Heather-Biggs – who mentioned Haynes once cycled "miles to visit the scene of the Luard Murder" and pushed "her way into the cellar of 39 Hilldrop Crescent, where the remains of Belle Elmore were discovered." Unfortunately, "the last fifteen years of her life" Haynes "was in constant pain and writing itself was a considerable effort" with "her only journeys being from her bedroom to her study," but "this struggle with cruel circumstances" was "lightened by the warmth of friendship existing between Miss Haynes and her fellow authors." Well, that dark cloud has long since passed and I'll be doing my part now in lifting Haynes from the memory hole of history by taking a look at her last novel. The Crystal Beads Murder is the last recorded case in the Inspector Stoddard series and has a plot clustering around the murder of the odious William Saunderson, a professional moneylender and part-time blackmailer, who's shot to death in the summer-house of Lord and Lady Medchester – during an evening of drawing-and billiard room activities characteristic of the early 20th century. A full house of potential suspects moved about the premise and garden, which isn't exactly helpful to the police, even though "an alibi is the easiest thing in the world to fake" and "the least satisfactory of defenses." There is, however, one tangible clue, "three crystal beads finked together by a thin, gold chain," which was found upon a second examination of the body, but a superintendent swears it wasn't there during the initial inspection of the victim. So did the murderer, or someone else, returned to the scene of the crime and left a "clue," of sorts? In this respect, the first half of the book often reminded me of the typical, 1920s mystery novel, but without excessive littering of monogrammed handkerchief and train tickets – which is a huge plus for a mystery writer who wrote and published practically her entire body of work during that decade. It's only to be expected that, stylistically, Haynes' work reflected the genre, as it was in the 1920s, which made the change of author especially noticeable in the second-half. A policeman is mortally wounded by a bullet in the second leg of the story and his dying process, and aftermath, isn't the emotionless affair that the murder of Saunderson was. Saunderson had a wife turning up out of nowhere. A wife who admitted her husband "had his faults" and didn't "see why he should be done in and nobody punished," but her main interest is the possible inheritance that could come her way in lieu of an official will. The portrayal of the emotionally devastated widow of the poor policeman is the complete opposite. There's a genuine sense of lost and even their home reflects this sudden, painful lost: the home looked "so familiar, and yet with life turned gray and the pivot of her very existence removed, it all looked flat and unresponsive," followed by, "the clock on the mantelpiece that she and Bill had bought when he got promoted to sergeant still ticked on with the same monotonous perseverance as ever, but it seemed somehow to be telling quite a different story." These brief snippets of grief really made me sympathize with the hangman. If you link that with another plot-thread, involving a domestic intruder attempting to force a marriage, and you've got another indication that the mystery author might have been Anthony Gilbert – because it reflects the kind of domestic strains she specialized in when her own career took off (e.g. Something Nasty in the Woodshed, 1942). I've got one, minor complaint, before I cut this overlong, rambling review short, which is the clue Stoddard uses to solve the case. It's a piece of evidence that’s sloppily overlooked by the police during their first investigation of the crime-scene and thrown in the inspectors lap by a passing tramp (Curt?!) and the policeman's widow, which prevents Stoddard from leaving an ever-lasting impression on the readers – and that's a shame since this was his last recorded case. But, aside from that, Connoisseurs of Murder will find another interesting and exciting rediscovery from the Golden Age of Mysteries in Haynes and The Crystal Beads Murder. The book is slated for release in early October of this year. "I think we're going to the moon, because it's in the nature of the human being to face challenges." 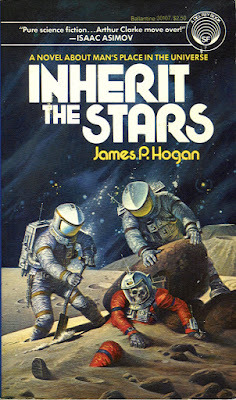 I'm not sure if James P. Hogan's Inherit the Stars (1977) would've captured my attention, if it weren't for a very tantalizing review on Ho-Ling's blog. 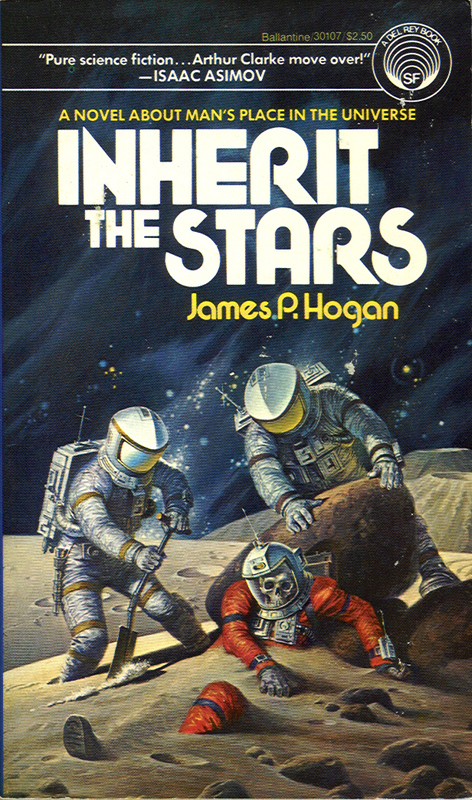 Inherit the Stars is categorized by some as a science-fiction mystery and procured a high-ranking spot on Japan's Tozai Mystery Best 100, which left behind many classics and fan-favorites – such as Agatha Christie's Death on the Nile (1937) and William L. DeAndrea's The HOG Murders (1979). That's something that'll get you noticed around this neck of the woods! The events described in the book take place between the years 2027 and 2029, which is only a mere 12 years away from us, but, evidently, it's set in a world where history took a different path. It's an alternative universe that saw "the ideological and racial tensions inherited from the twentieth century" being swept away as a result of a "tide of universal affluence and falling birth rates that came with the spread of high-technology living." A surplus of funds and resources, that became available after worldwide demilitarization, where shoveled in a rapidly expending United Nations Solar System Exploration – which has a floating laboratory above Venus, exploring Martian surface and has settled the Moon. Than they make a discovery that could "keep the entire scientific world arguing for decades." A normal-sized, anatomically modern remains of a human in a spacesuit is uncovered on the Moon, who’s christened "Charlie," but carbon-dating poses a serious problem to the scientific community and recorded history: the semi-mummified corpse and equipment is over 50.000 years old! It's a problem of the impossible kind, because humans were primitive hunters-gatherers at that period in time and than there's the lack of archaeological evidence of an ancient, technological advanced civilization in Earth's prehistory. There are droves of scientists examining Charlie and his equipment, which range from physicists and linguistic experts to mathematicians and evolutionary biologists, but the main character the readers follows around is Dr. Victor Hunt – who's the one who eventually pieces everything together and comes up with a beautiful, unifying hypothesis to explain all that they've discovered. It's next to impossible to give a brief, teasing summary of the investigation between Charlie's discovery and Hunt's explanation, because of the enormous scale of events and potential spoilers involved. 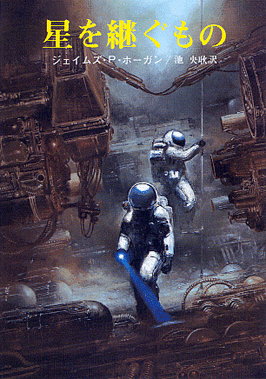 The extensive reconstruction of the distant past, analyzing of evidence and tossing around theories is very reminiscent of the detective genre, but key elements of Inherit the Stars are firmly rooted in science-fiction and this makes the book very different in nature from other science-fiction mysteries that attempt to find a balance between the two – such as Manly Wade Wellman's Devil's Planet (1942) and Isaac Asimov's The Caves of Steel (1954). On the other hand, you should be able, based on the given evidence, to arrive at a similar conclusion as Hunt and that's quite an accomplishment if you know what the explanation is – which is, as Ho-Ling noted in his review, something that goes beyond a simple murder case with an alibi-trick or a locked room. I actually feel embarrassed about my second-rate solution that had the carbon dating pegged as a red herring that covered the fact that Charlie was actually from a far-flung future instead of the distant past. Luckily, I was as wrong about that as my first impression that the solution might've been a cross between the Piltdown hoax and legends of missing Soviet cosmonauts. So, before this becomes another shabbily written, outdrawn review that uses a lot of words to say very little... I'll conclude by saying that, read as a mystery, you'll find something far, far off the beaten track – which isn't necessarily a bad thing. The only sad part about Inheriting the Stars is that we, in 2027, won't have any people "exploring the Martian deserts" or plummeting "down, down, deep into the ice crust of Ganymede" inside a protected capsule to witness something truly special. Finally, I tagged this review as a "locked room mystery" and "impossible crime" for one simple reason: we're culturally appropriating this novel. It's ours now! "Well, it's all clues, isn't it? On a whole, crosswords are far more exotic and exiting than police work." During his lifetime, E.R. Punshon garnered favorable reviews as a fully-rounded mystery writer from the likes of Dorothy L. Sayers and the pseudonymous "Torquemada," but decades of shameful neglect preceded his slow rediscovery during the 2000s and now his work is finally brought back into circulation – courtesy of Dean Street Press. I first took notice of Punshon when I read Nick Fuller's now defunct website, which described his "ability to construct labyrinthine plots" as being "rivaled only by John Dickson Carr." Well, that comparison made me perk up like a prisoner receiving a jolt from the electric chair and I could see why the comparison was made when I finally read Information Received (1933). It was an excellent mystery novel reminiscent of Carr's darker, standalone work such as Poison in Jest (1932) and The Emperor's Snuff-Box (1942), but it was the only one I could get my hands on at the time. 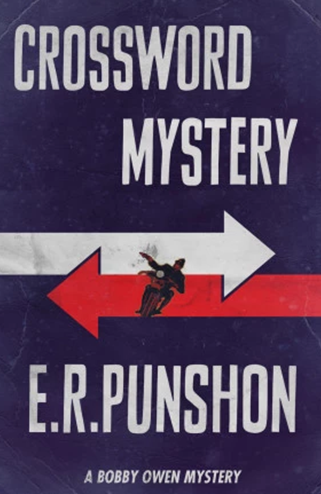 So I'm glad Punshon's is made accessible again to today's horde of mystery readers. Crossword Mystery (1934) is one of the titles reissued this past summer and has an introduction written by our crime-fiction historian Curt Evans, which described it as "a novel with an intricate, fairly-clued puzzle, incisive social observation" capped with "an astonishing climax that surely is unique within the literature of crime fiction" – alongside some glowing quotes from Dorothy Sayers and Charles Williams. The latter saw in the book hope for the detective story's future and placed it alongside Ronald A. Knox's Still Dead (1934) and Sayers' The Nine Tailors (1934). You could argue that Evans' preface is more of an appetizer than an introduction. The book opens with Punshon's series-character, Detective-Constable Bobby Owen, being send to Suffby Cove, which is a quiet, seaside village that had remained largely untouched by the 20th century. Owen's task is to pose as a houseguest in the home of a retired stockbroker, Mr. George Winterton, who's convinced that his brother's drowning was murder and requested protection – because he fears he may be next. There are, of course, multiple suspects milling around the place, which includes three of Winterton's nephews: a horse-racing fanatic, named Colin Ross, a painter and black sheep of the family by the name of James Matthews and Miles Winterton – who was reprimanded by his uncle for flirting with his secretary. Miss Raby is Winterton's secretary/typist and types out the pages for his book, Justification of the Gold Standard, while in her spare time she constructs crossword puzzles for the Daily Announcer. The list of suspects are rounded out by the servants, Mr. and Mrs. Cooper, and a businessman from London who wanted to turn Snuffby Cove into a seaside resort, which George's brother managed to prevent before his drowning. All of the ingredients for a proper, thoroughly English country house/village mystery are present, but Owen wonders, early on the case, who "would want to murder two quiet, inoffensive, retired business men" spending their old-age at the coast – writing books, solving crossword puzzles and swimming in the cove. The answer is that there's obviously someone when an unmistakable case of murder occurs and it's (briefly) presented as a locked room mystery! Owen has instructed Winterton to lock his bedroom door and fasten his windows, which are still in place the following morning and even the key is sticking in the lock from the inside. However, the body of the locked room's occupant has been mysteriously transported to the lawn outside, but the mystification about this aspect is cleared up within one chapter and the explanation is pulled from an old bag of tricks – very similar to the impossible elements from Agatha Christie's Hercule Poirot's Christmas (1938) and Nicholas Blake's The Case of the Abominable Snowman (1941). So I have to tag this as a locked room mystery, but with reservations. After the second murder, the story slowly moves away from the traditional country house-and village mystery to a treasure hunt-type of thriller. A clumsily made crossword puzzle with a keyword, "Gold," made by Winterton's is key to this hunt and beautifully reproduced in this edition. 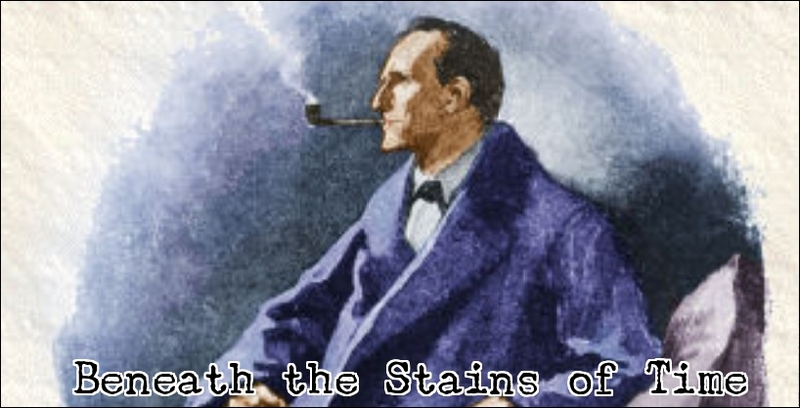 Anywhow, I have seen this portion of the novel being compared to (there she's again) Sayers' "The Fascinating Problem of Uncle Meleager's Will," from Lord Peter Views the Body (1928), but I thought the plot was more indebted to Sherlock Holmes than Lord Peter. There are light signals seen in the garden that might be connected to a recently released criminal (The Hound of the Baskervilles, 1902), but there's also a dog that doesn't bark when he's supposed to ("Silver Blaze") and the treasure hunt reminded me somewhat of one of my favorite Holmes story, "The Musgrave Ritual." However, the most intriguing aspect of Crossword Mystery is that it was published in the same year as Darwin L. Teilhet's The Talking Sparrow Murders (1934), which are among the earliest examples in fiction that took a critical look at the then new Nazi regime in Germany. This aspect in Crossword Mystery is poured into a late chapter, but it's there and with its connection to the solution one could argue that it's a prelude of the deluge of WWII mystery/spy-thrillers that would flood the market less than a decade later – making Punshon somewhat of a visionary. I would have preferred if Punshon's would've stayed within the territory of the country house/village mystery, because that was the best part of this book, but, historically, the final stretch of the story isn't without merit either. So I'll end this messy, over-referenced review on that note, because I can't seem to write anything short and to the point these days. "I'm afraid you'll think I haven't exactly been minding my own business. Why should I, anyhow? Two months in this place ought to reveal all our secrets, if we have any. Mind you, it was a sheer accident in the way it happened..."
There are several well-known documented cases of hobby deformation among mystery readers, which include associating the literary father of Winnie-the-Pooh, A.A. Milne, with The Red House Mystery (1922) and Gaston Leroux with Le mystère de la chambre jaune (The Mystery of the Yellow Room, 1907) instead of La fantôme de l’opéra (The Phantom of the Opera, 1910). Similar examples dot the landscape of the genre, but there's one writer I'll never be able to associate solely with his one-off contribution to the detective-and thriller genre. 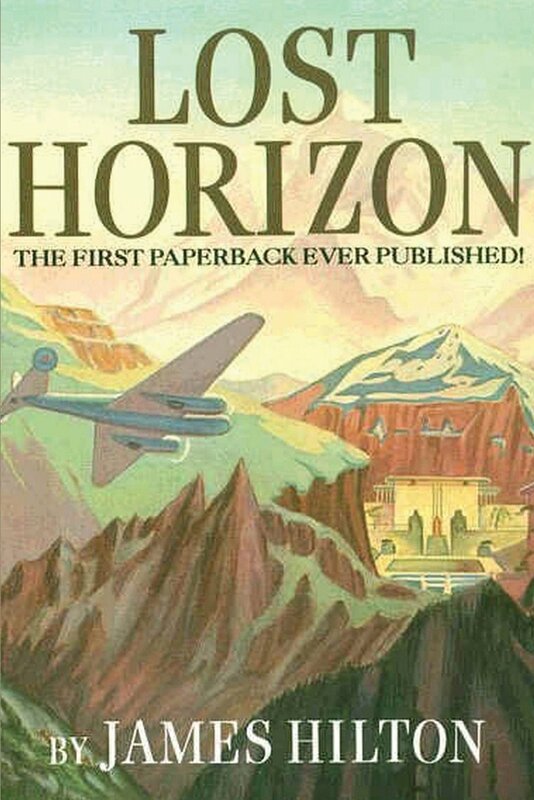 James Hilton was an English novelist best known today for Goodbye, Mr. Chips (1934) and a wonderful adventure-fantasy novel, Lost Horizon (1933), which I read during a short period when I was reading "Lost World" stories. There were, however, only a small amount of such books available at the time. 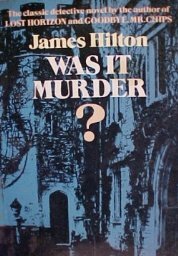 So it was only a brief excursion outside of the detective story, but it did put Hilton's sole mystery novel on my radar. Was it Murder? (1931) originally appeared as Murder at School, under the byline of "Glen Trevor," which remained an obscure fact for decades after success came knocking on Hilton's door and one presumes the book was filed away as a youthful indiscretion – until Dover Publications brought it back in circulation in the late 1970s. The backdrop of the book is a minor, unassuming public school, named Oakington, where a student by the name of Robert Marshall fell victim of a peculiar accident when a heavy, old-fashioned gas fitting crushed his skull in the dormitory during the night. Dr. Robert Roseveare, current Head of Oakington, would've let the dead rest in peace were it not for a strange note he found inside the boy's algebra-book, telling that "if anything should happen to me, I leave everything to my brother Wilbraham" – which aren't the kind of thoughts you'd expect to be on the mind of a public school boy. Dr. Roseveare calls in the help of an old student, Colin Revell, who once solved "a little affair at Oxford" when "a rather valuable manuscript had disappeared from the College libraby" and had solved the case "by means of a little amateur detective-work." The first impressions of Revell begs for comparisons with Roger Sheringham and Philip Trent, but there's a difference between the fallibility of the later two and the incompetence of the former. Oh, there's enough to enjoy about Revell's handling of the case for the plot-driven reader. There are plenty of possible explanations bandied about and leads to follow up on around the school grounds, but Revell never appears to be fully on the mark and eventually has to leave without having cleared up the first death – not to the readers satisfaction anyway. I mean, why were the students who were sleeping right next to Marshall never considered to be suspects or even questioned as potential witnesses? That's just sloppy. There are several months between Revell's first and second visit to Oakington, which occurs when learning about the supposedly accidental death of Wilbraham Marshall in the empty swimming baths of the school. It smacks of murder and has attracted the attention of an actual detective from Scotland Yard, Guthrie, but he only gives off the impression of being more competent than Revell and eventually leaves empty handed after a third fatality – which is annoying because I had correctly figured out the correct solution at this point. And they were still roughly a 150-pages removed from stumbling across the solution themselves, but Hilton's pleasant, often light-hearted style has to be commended here as it sustained my interest in the story. The "surprise" revelation fell somewhat flat, but the effort was appreciated. I also found it interesting that, in spite of the witty writing, there's somber shadow cast over the story by the Great War and its lingering affect it had on some of the characters. I've always been interested in detective stories that are tied to the World Wars of the 20th century, but I don't remember having ever read one in which the ghost of World War I was almost background character in itself. A very interesting aspect of the book. Anyway, Was it Murder? is a prime-example of the amateur detective and mystery novel, but whether that's a good or bad thing is up to the individual reader. 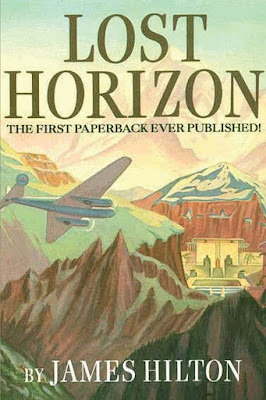 I'm still very divided on that question, but I do want to re-read Lost Horizon now, because that's a prime-example of an excellent potboiler!